The Zurich Chess Challenge was contested by World Champion and Numero Uno GM Magnus Carlsen; Number Two and recent winner of the Tata Steel Tournament GM Levon Aronian; U.S. #1 and World #3 GM Hikaru Nakamura; Italian superstar GM Fabiano Caruana; Israeli uber-strong GM Boris Gelfand and, last but not least, former World Champion GM Vishy Anand. It sounds like a dream to have all these chess-stars together in the same event. 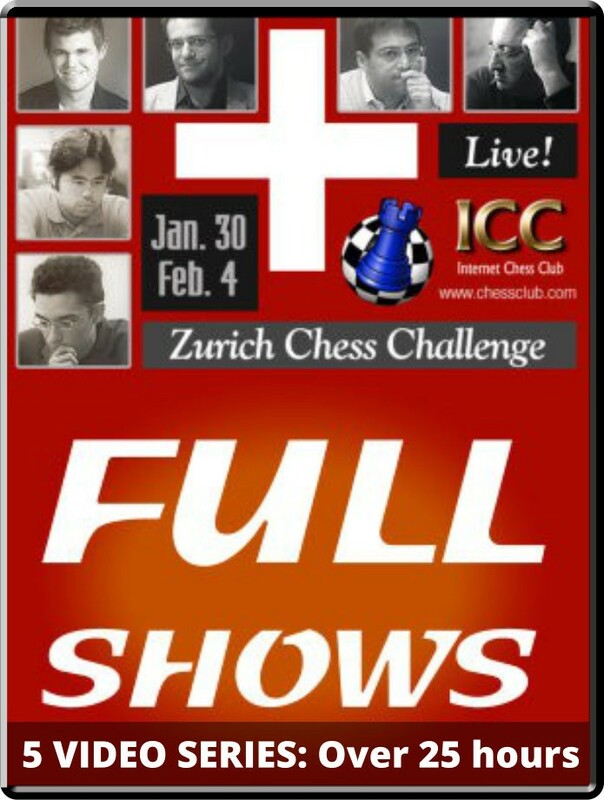 By popular request, the ICC is making the ENTIRE broadcasts of the Zurich Chess Challenge available so you can live and relive each game! Own the entire series! Over 25 hours (25:36:14), covering the entire tournament! You can watch the FULL shows on your mobile device or computer. Take the videos with you anywhere! Own the entire series! Over 25 hours (25:36:14), coveraging the entire tournament! You can watch the FULL shows on your mobile device or computer. Take the videos with you anywhere!